Bald eagles near Courtenay, B.C., are starving after a poor chum salmon run last season, bird watchers say. 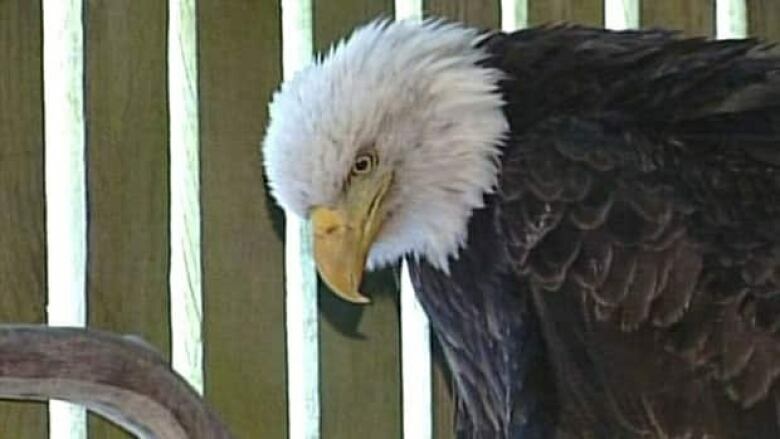 Bird watchers in Courtenay, B.C., say bald eagles in the area are starving to death after a poor chum salmon run last season has left them working even harder to find food. Warren Warttig, the president of the Mountainaire Avian Rescue Society, says the group is now nursing five eagles back to health. "We had one that was so emaciated, we think it fell out of the sky and hurt its chest and had to be nursed back. And others, quite often people are reporting they're leaning up against a tree and not looking very good," he said. He added that the dearth of chum salmon affected not just the east coast of Vancouver Island, but also eagles in Brackendale, near Squamish. Warttig says the herring runs will begin any day now, which should end the crisis for the hungry birds. Chum salmon head upriver to spawn and then die off after spawning all along the B.C. coast. The run begins in October and continues until the end of November, Warttig said.In some places, the salmon run until early December. They are a crucial food source that help eagles get through a fasting period from December to February because they spawn later than other salmon and have more fat than other species, Warttig added. He thinks the poor chum salmon run will probably affect local bears, which use them to fatten up before hibernation. "They'll probably be coming out in pretty rough shape from hibernation this spring." FEATURE: Eagle Cams from Sidney, B.C.